The Roof Open Drainage Tile provides consistent drainage on your outdoor or rooftop flooring surface. This drainage tile is 1 inch high and 32 x 32 inches. The AirField AirDrain tile has a 92 percent air void and will drain 2.85 inches of rainfall in one minute on a nearly flat surface (1/2% of 1% slope). They have a vertical and lateral drainage rate which cannot be matched. The drainage tile can be installed on an aggregate sub-base, concrete, asphalt or rooftop. Use these drainage tiles under your outdoor flooring or artificial turf surface. Roof Open Drainage Tile is only limited by the material above it and the exit drains. There is practically no resistance to drainage because of the 92% air void. The important factor is the percentage of slope that the tile is installed on. These tiles can can .576 gallons of water per square foot if needed until it can release the water to the perimeter exit drains. Consider these tiles under artificial turf for sports, dog areas and landscaped areas. When installed under synthetic sports turf, this drainage tile can also provides consistent shock attenuation properties which will contribute to the safety of players. Made of a polypropylene plastic, this durable tile can be reused again when the artificial turf is replaced. Greatmats’ Home MMA BJJ Mats are the perfect way to convert your garage, basement, or other home space into a studio of your very own. Practice jiu-jitsu and wrestling in the comfort of your own home to get a leg up on the competition. Consider these mats for use with MMA studios, home grappling areas, BJJ workouts and mixed martial arts training. Put BJJ mats to work for you in your own home practice studio. With these BJJ mats for home, you can practice on the same professional quality mats that you use at the dojo. These 2×2 foot mats interlock like a puzzle for easy and secure installation that you can do yourself. Specifically designed for the abuse that comes with MMA training and competition, these mats are durable and are the perfect way to outfit your home studio for years to come. The BJJ mat is used is by world champion BJJ fighters and professional MMA coaches/trainers such as 7-time world BJJ champion Rodrigo ‘Comprido’ Medeiros, who has coached the likes of former UFC Heavyweight Champion Brock Lesnar, current UFC welterweight Demian Maia and 11-time world champion Caio Terra. BJJ mats for home are a full 1-5/8 inches thick for plenty of shock absorption. They feature a durable tatami, no-burn surface texture which offers just the right amount of grip for footwork without causing rug burns. You can roll easily without sliding, and the slight grip helps to keep you from getting caught as you move. If you’ve ever wanted a home studio of your own, need a safe practice space, or just want a home grappling area so that you can practice with friends or family, these Jiu-Jitsu mats for home are an affordable, practical and safe solution. They are specifically made for use with the grappling arts: Judo, Jiu Jitsu and MMA. Choose from two color options: red/blue or black/gray combinations. These mats are double-sided and double-colored, so you can reverse them to create a dual-color design in your own home. While each mat comes with two edge pieces so that you can create a polished, clean edge, these mats can also be installed for a wall-to-wall fit. Simply cut them with a sharp utility knife. These puzzle mats BJJ can be installed on any hard, flat surface, even concrete. The BJJ mats for home are suitable for both soft martial arts shoes and for bare feet. They are made from EVA high density foam. Completely waterproof, these durable mats will last you for years to come. At 2×2 feet, the square mats are conveniently sized. They can ship via ground delivery instead of freight, saving you money and resulting in a faster delivery. These mats can also be easily stored in a closet, making them perfect for home use. There’s no beating the convenience of having your own MMA studio in your home, and these BJJ mats allow you to create your own practice space at an economical price. With a studio of your own, you can practice in comfort. Your own practice space gives you a chance to work on the skills that you learn during lessons, so you can progress more rapidly with your training. Practice your skills in the peace and quiet of your own home, or invite friends over to prepare for upcoming tournaments or promotions. A home studio provides the perfect opportunity to grapple with trained friends or family. Work on your skills when it’s convenient for you without worrying about studio hours or transportation needs. With a home MMA or BJJ gym, you’re not limited to hours of operation. If you’re competing, there’s no better way to maximize your chances of success than by having your very own studio right at home. Don’t forget the safety advantages of taking the time to create your own MMA studio. Practicing Jiu-Jitsu without a specially designed space can be dangerous, and takedowns can result in injuries. Whether you want a safe space for your own practice or you need a space to keep the kids safe as they learn their own skills, these home MMA mats can help to prevent injury from takedowns and falls on surfaces that are too hard. Do you need additional practice space for your professional Jiu-Jitsu or MMA studio? These BJJ mats may be the perfect solution. Convert any space into a safe practice and sparring space quickly. Installation is easy and fast with the interlocking design. Within minutes, you can have an extra space to use during training, workshops, or other events. Looking for something larger for a professional studio? Our 1×1 meter Grappling MMA mats offer the same professional quality foam on a larger scale. 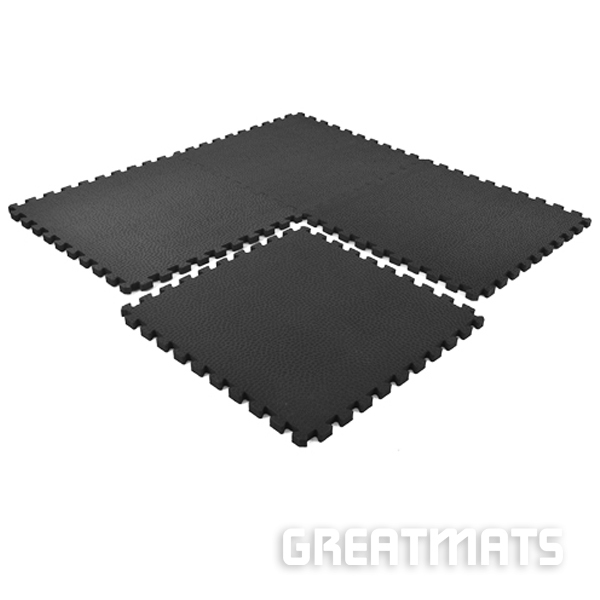 We’ve had plenty of customers use these Jiu Jitsu mats in their home gym spaces. The mats create a cushioned workout space. If you will be doing floor exercises like crunches, these mats will take the sting and pressure out of exercising on hard floors. Home MMA BJJ mats also help to absorb some of the sound generated during workouts, making for a more enjoyable home gym space. Please note that these BJJ mats are not intended for use with free weights, as dropped weights can damage the mats. Unsure of just how many tiles you need, or how to create that perfect design? Give Greatmats’ Online Floor Plan Designer/Estimator a try. This online tool will help you to calculate just how much footing you need while minimizing the amount of material that may be wasted. It’s a great way to maximize your savings. Before installing these jiu jitsu puzzle mats, let them acclimate to the room for 48 hours. Remove them from the carton so that they can fully adjust to the heat and humidity conditions. This will help eliminate struggles with expansion and contraction that is common with foam flooring. Installing these home BJJ mats is easy and can be done without any professional help. These might be the easiest form of flooring to install. Begin with a clean floor, and start in a corner. Push the tiles together like a puzzle, working your way out from the corner until you can no longer fit full tiles. If you do not want to create a wall-to-wall mat, then simply add on the edge pieces for a clean, finished exterior at this point. When performing wall-to-wall installations, leave an approximately 1/2 inch gap around the perimeter of the room. This gap allows for the mats to expand, which can happen with fluctuations in heat and humidity. Measure the remaining distance between the tiles and the wall, and cut the remaining tiles to fit using a straight edge and utility knife. The tiles fit together like a puzzle, and you won’t need any glue or extra tools. We recommend keeping direct sunlight off of the home jiu jitsu mats, since it can cause expansion. Additionally, steam cleaning the mats can cause them to expand. These BJJ mats for home are designed for use with bare feet or soft shoes only. These mats are not rated for commercial use in high traffic areas. Please note: Color tone variations can, and will most likely, occur within the same batch of mats. Even mats that are made at the factory within minutes of each other can vary in color. This is common with all foam puzzle mats. Cleaning these mats is easy. The mats can be mopped with common household floor cleaners. Avoid using bleach. If you need to vacuum the mats, test the vacuum on an inconspicuous area before using it on the rest of the mat. BJJ mats for home ship in cartons via ground service to your door. For larger orders, products may ship via freight delivery. This product ships UPS Ground, FedEx Ground, and/or Freight. This StayLock Perforated non-slip outdoor decking tile is a 1×1 ft modular tile made of soft plastic material. This tile is specifically designed for rooftop installations over rubber roofing membrane for residential and light commercial use. The Staylock Perforated Tiles delivers traction and comfort on wet surfaces such as rooftop decks, patios, spa, pool surrounds, shower floors, and industrial floors. This modular tile is designed specifically for outdoor installations. This tiles features an ASTM Fall Height Rating of 20 inches. StayLock Perforated non-slip floor tile easily connects together with an active tab locking system that will not allow the tiles to separate over time. This modular, perforated floor tile is perfect for pool and spa surrounds because it is easy on bare feet and durable enough for tables and lawn chairs with feet larger than about 1.5 inches in diameter. The top surface of this non-slip tile will provide traction when wet and comfort for standing and walking. This deck tile is safe to place directly on top of rubber roofing membranes without damage over time due to the rounded edges of the under-structure of this tile. StayLock Perforated tile provides great drainage on any flat surface. Safely install this for institutional or residential outdoor swimming pools, patios, greenhouses, rooftops and decks. This product also works great for areas around spas or hot tubs. Use this modular non-slip floor tile for industrial applications where workers may be exposed to a wet floor. This tile will provide an anti-fatigue benefit for people standing for long periods of time. This PVC tile is naturally resistant to most oils and many acids. StayLock perforated non-slip floor tile easily connects together and does not require any glue for installation. Easily cut this modular perforated tile with a sharp utility knife for wall-to-wall installations or to install around poles, table legs or other obstacles on the floor. These modular non-slip flooring tiles can be separated and taken up or relocated easily, if needed. Also available in a designer look with your choice of several popular colors. This non-slip floor tile can be custom ordered in virtually any color desired. Optional border and corner pieces are also available. Black tiles are made from recycled content material and may contribute to LEED points in Green buildings. GreatDeck Outdoor Wood Deck Tile Pine – Sienna Brown is a durable deck tile made with pressured treated pine that is guaranteed for 35 years against decay, rot, termites and mildew. These pine deck tiles feature an attractive Sienna Brown finish. These GreatDeck Wood Deck Tiles feature lasting durability. Use these deck tiles on balconies, terraces, courtyard, patios, decks and rooftops. GreatDeck Tiles provide optimal water drainage on properly graded surfaces. Each GreatDeck Pine Deck Tile is 23.75 x 23.75 inches and 1 inch thick. The deck tiles can be installed all in one direction or you can create a parquet or checkerboard pattern. The tiles can be installed over any hard, flat surface. This deck tile product does not require nails, glue or screws. The tiles can be cut to fit. This product has a two year manufacturer’s defect warranty against improper assembly and defective pressure treating. Interlocking rubber floor tiles 8mm are an extremely popular rubber flooring option for home gyms and residential weight rooms. For personal work outs, it is essential that the flooring can withstand the rigors of machines and weights. 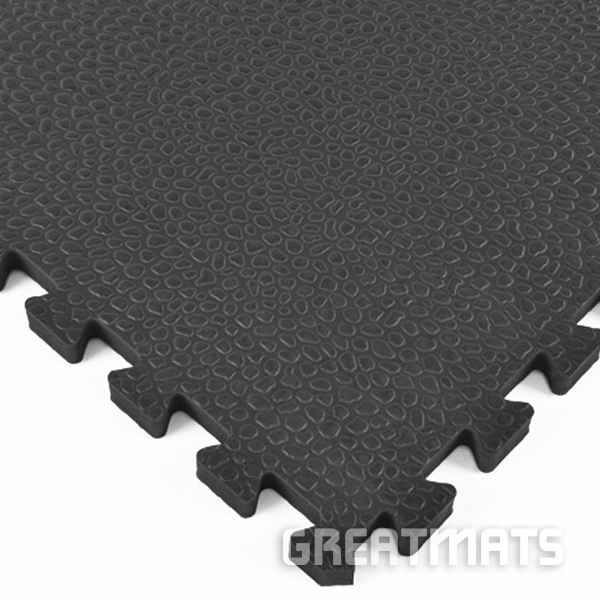 Greatmats has just the product needed with our interlocking rubber mats! The interlocking rubber floor tiles are 2×2 ft. in size and 8 mm thick. This size provides adds to the durability of the rubber flooring while allowing the product to still be easy to install and move. With a universal interlock design, these rubber tiles will lock together no matter which sides align. Because of their durable, resilient surface and easy installation, interlocking rubber tiles are some of our best-selling rubber products. Weighing just over seven pounds, this rubber tile is easy to handle and installs with no adhesive. Cut interlocking rubber floor tiles with a common utility knife for a wall-to-wall installation. Interlocking rubber floor tiles are very easy to disassemble and move should they be needed to relocate. Our rubber interlocking floor tile is made from recycled rubber material, is good for the environment, and qualifies for LEED points. Whether you need to install it in a large or small space, this mat is up to the challenge. Available in 5 different colors, we have the right rubber tile to fit any interior design need. Interlocking rubber mats are offered in: solid black, 2 basic colors and 2 dynamic color (mixes of light gray/blue and tan/brown0. Our interlocking rubber floor tiles can truly be customized to the room around it as the colors are 100% black, 10% color fleck in tan/brown, blue/light gray, blue and light gray. Color options are a full 10% color fleck mix. For the two color combined color options, each color in the combination makes up 5% of the blend. 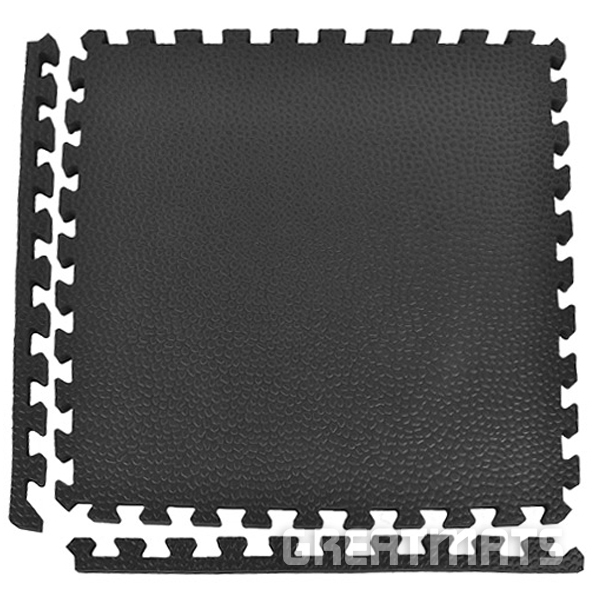 These interlocking rubber mats come with a 5 year limited warranty. This durable, thick and portable interlocking rubber flooring tile is perfect for home gyms, basement floors and garages. Actual tile coverage after interlocking 23×23 inches. Our interlocking rubber flooring tiles feature a tile coverage of 3.67 square feet after interlocking the tiles together. To help calculate the tile count for your room, you can use our interactive Floor Plan Designer. For larger commercial rubber gym floors where an interlocking rubber floor tile is needed, we recommend our larger Geneva line of 3×3 foot rubber tiles. 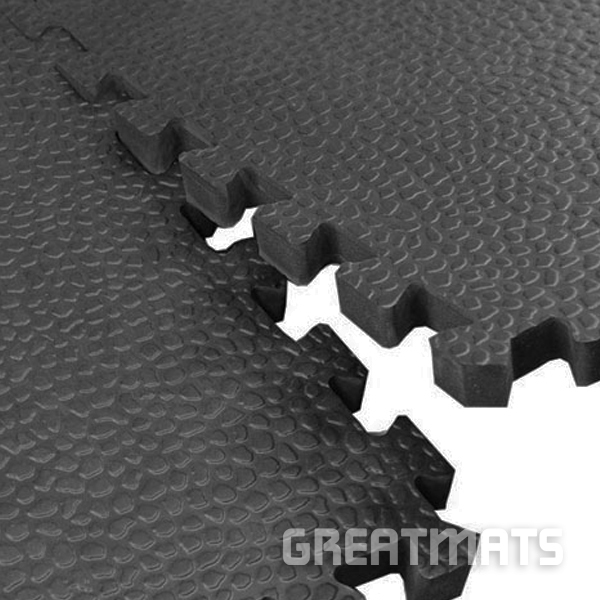 Greatmats offers these interlocking rubber flooring tiles at the most competitive prices available. Please speak with customer service about quantity availability for larger installations. 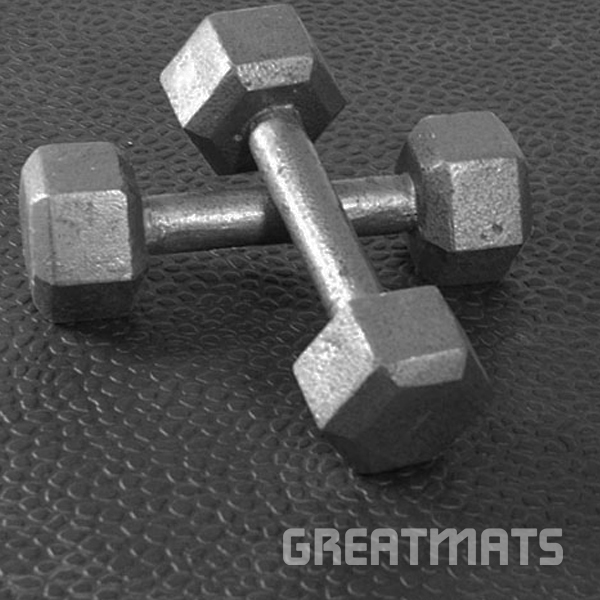 Gym Floor Foam Tile Pebble Top 3/4 Inch is available in this durable all ethylene vinyl acetate (EVA) foam flooring tile. 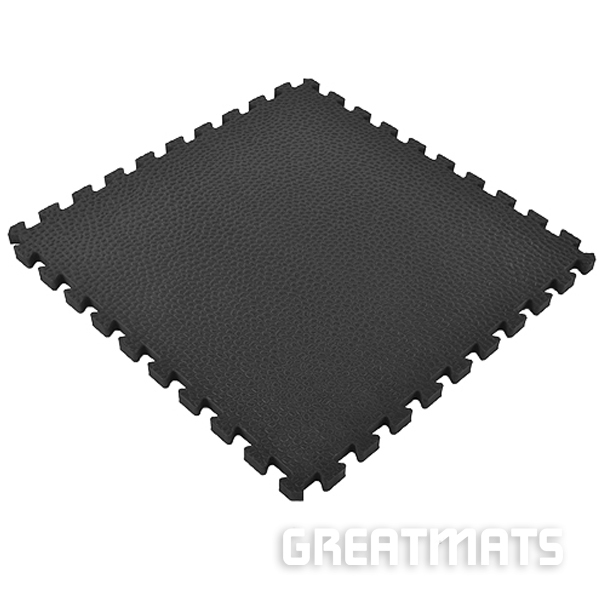 Made of quality foam and designed with a super durable pebble top surface pattern, this exercise room flooring tile is an excellent option for home exercise and gym floors where a lightweight and durable flooring is needed. Our non-slip pebble top foam tiles are made with a very high-density polyethylene and EVA foam material. At 3/4 inch thickness, this double-sided tile will stand up to great punishment and is kid safe. Although not quite as durable as rubber, this floor tile comes the closest of any foam product we have available. These exercise room floor tiles can withstand all types of exercise equipment. The tile measures 21 mm thick (plus or minus 1 mm). Each tile comes with a universal interlocking system and two border strips, making corner or island layouts a possibility. This workout room flooring option is designed to last for years beneath exercise equipment and comes with a 1 year limited warranty. The reversible 2×2 foot square pebble top tiles will not absorb moisture and are available in black only. Use these gym mats as portable horse stall mats for traveling events, temporary installations and trailers. 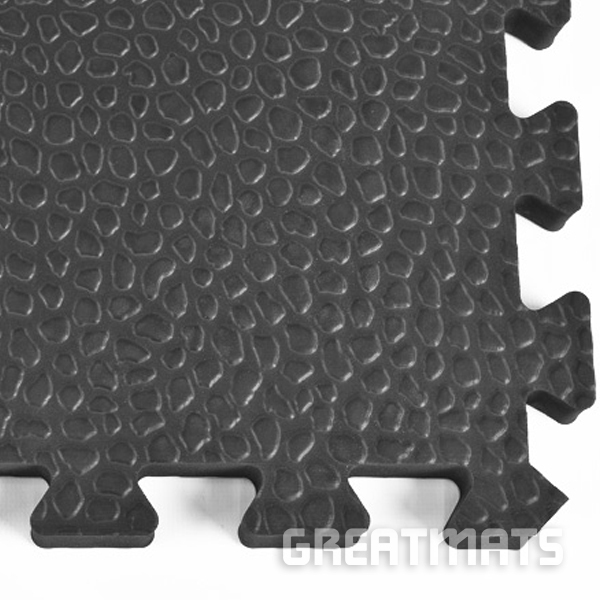 This high density EVA foam mat is an excellent for horse stall installations and will withstand the weight of a horse. These portable mats are made of waterproof foam material that makes the stall mats lightweight and easy to travel with. These are a great alternative to heavy rubber mats. These mats are designed to be used in temporary and low use installations. We do not recommend this product for extended permanent use in a horse stall. Install our foam exercise flooring over any hard, flat surface and interlock the tiles together for a fast and easy installation. Pebble top exercise room flooring can be easily cut using a sharp utility knife or box cutter, ensuring ease of wall-to-wall installation. Use a straight edge to ensure a straight cut. Please do not expose this product to direct sunlight for extended periods. Sunlight cause the mats to expand and deform if exposed to direct sunlight over time. This foam tile is not rated for commercial use in high traffic areas. EVA foam tiles are subject to expansion with dramatic changes in heat and cold, related to exposure to direct sunlight and/or significant increases in humidity, or throughout an annual freeze / thaw cycle in outdoor environments. Sweep the floor to remove dry debris. You can also choose to run a vacuum over the flooring, but you should test your vacuum in an area of the tile that isn’t easily seen. Some powerful vacuums can cause damage to the surface of the floor. Damp mop the tiles using hot water and a household floor cleaner, as long as it doesn’t contain bleach. You also can spot clean small areas of the tiles using a sponge or gentle scrub brush and a household cleaner. Steam cleaning may heat up the tiles and cause them to expand. After mopping the tiles, you can allow them to air dry in place in the room, or you can disassemble the tiles before washing them and allow them to dry in another location. Interlocking Foam Economy 1/2 Inch Mat can be installed on any hard surface to create a safe and soft matted flooring solution. 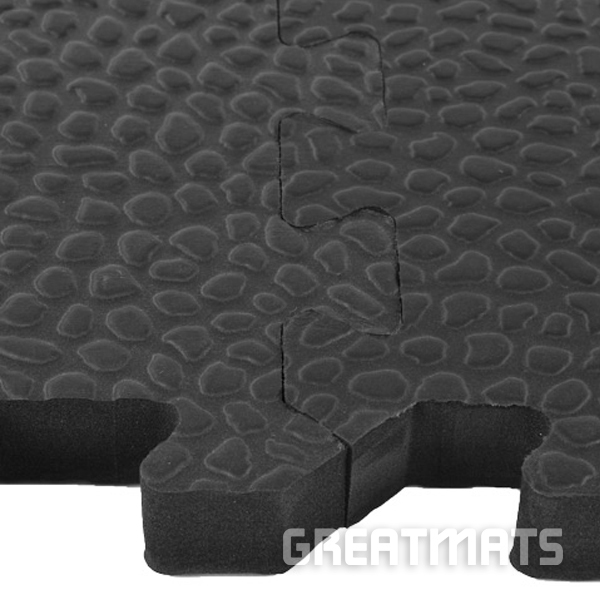 This interlocking foam mat is 12 mm thick and is an economical foam matting. These foam mats offer an excellent foam flooring option at an affordable price with a quality foam material. Our mats feature an easy to clean, non-slip thatch surface. 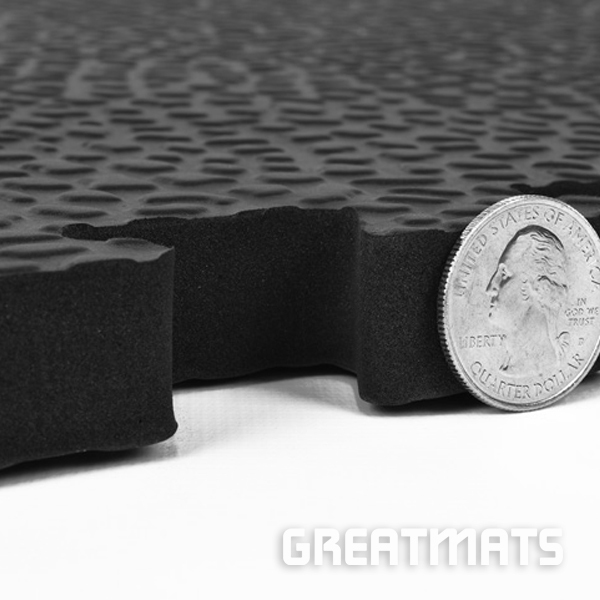 Available in grey, black and blue color options, you can create your own custom design with these foam mats. This foam mat product can be used in homes and schools. The mat is waterproof and color safe. The mats are durable, easy to install and will last for years. Use this foam mat on a basement floor, in a kids’ playroom or in the garage. These mats can be used for trade shows or temporary floor applications. Color and shade may vary somewhat from mat to mat within the same order. This is common with EVA foam matting. This foam tile is not rated for commercial use in high traffic areas. Because of the no-slip surface texture of the bottom of this foam tile, it can be used for dog agility flooring when installed upside down. You can expect to see some toenail scuffing, puncturing, indentations or other markings in the surface of the dog agility mats. This does concern some customers aesthetically when it initially occurs. However, these surface markings and indentations will not affect the performance of the agility mats or change the dog agility mat’s ability to provide maximum anti-fatigue cushion and traction. This foam tile can be placed directly on any hard, flat surface. Simply interlock the mats together and use. These foam mats are lightweight and portable. They are easily removed if needed. Allow the foam mats to acclimate to your room before installation. The foam can expand with changes in heat and humidity, allow a 1/4-inch expansion gap for wall to wall installations. For aerobics or exercise activities, do not place the mats on top of carpeting, as the mats can shift. When used outside, the foam mats may expand and curl if exposed to direct sunlight in warm climates for extended periods of time. Have your vacuum cleaner set at highest setting, or just use hose and nozzle. Don’t use a power head. High-heeled shoes can puncture the foam mats. You also can use a mop and warm water on the mats for a more thorough cleaning. Do not use a bleach based cleaning product on the tiles, but most general household floor cleaners will be safe to use. Steam cleaning may heat up the tiles and cause them to expand.